Whether Salesforce.com’s flagship conference at Moscone Center was the most attended conference (~48,000) or the most registered for event (~90,000), matters not. When examined in context of the magnitude of what was accomplished, the impact of this 10th annual event transcends attendance numbers. Business folks and the converted IT brethren converged on the week of September 18th, 2012, to see what the future could be inside the enterprise. They left with inspiration and the gospel of what was possible, as told by those before them. The event represented the intersection of where aspiration meets innovation for the enterprise. Attendee sentiment signals the return of the front office. Prior to the coining of the CRM term, front office was the term which defined marketing, service, eCommerce, and sales force automation. The move back to integrated customer experiences reflects a renewed interest in all the front office touch points and all the support in the back office required to support the customer experience. Attendees walked in with questions about how to integrate their legacy ERP and expose their transactional systems into the front office. Product announcements and pre-announcements bring the enterprise closer to the consumer experience. Pre-announcement of Salesforce Identity for Winter 2013 will provide users with Facebook-like single sign on and identity management services. The availability of the Touch Platform services will provide a write once, deploy anywhere touch based mobile UI Experience. The pre-announcement of the Force.com Canvas provides a UI layer to run any other application within the Salesforce.com environment. The App Exchange Checkout delivers out of the box billing for developers and improves the users app store experience. Geolocation capabilities in the pilot of database.com in the Winter 2013 release will improve mobile experiences. Chatter communities pilot in Fall of 2012 and pre-announcement addresses the issue of multiple group management. Salesforce.com aspires to be the center of the innovation ecosystem. Many have speculated that Salesforce.com would enter the back office market with finance or HR. Others have thought it would invade the marketing automation or service ecosystem. Conversations with product strategists and executives hint that the longer term goal is to facilitate the innovation ecosystem. Recent investments in updating Force.com and initiatives to attract new ISV and system integrators to the partner ecosystem demonstrate this commitment. In fact, Workday announced Salesforce Chatter inside its core product. Infor’s CRM team has built its marketing lead generation product, Inforce Marketing on the Force.com platform. Gamification platform Badgeville joined rival Bunchball into the Salesforce.com ecosystem. However, organizations should not be naive about the change management issues required for success. Adoption has always rested with the people. Organizations require time and repetition to reinforce transformational principles. In addition, technology governance is required to avoid issues with SaaS/Cloud best of breed hell when line of business leaders rapidly and randomly deploy solutions without considering process granularity, data integrity, and meta data integration. Significant effort is required to provide an engagement layer for mobile, social, and analytics. Keep in mind, Salesforce.com lacks an analytics platform. 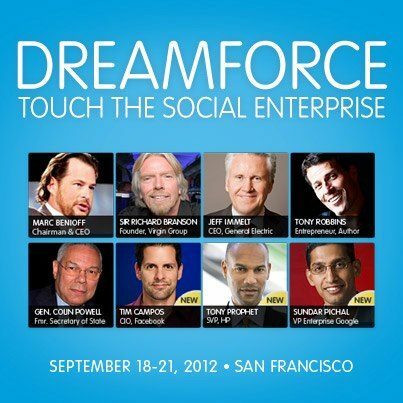 Dreamforce showed the art of the possible. Management teams must take the next step of investing in the change management and the architectural integrity required to make it possible. The journey won’t be a simple plug and play, but it will be much better than what we experienced the last cycle.